At the Bridge we are building a discipling culture. And building a discipling culture isn’t just for adults. In fact, kids usually grasp and apply the things Jesus taught more quickly than we do as adults. That’s why we use fun children’s curriculum that teaches the power of God’s truth in a way that is relevant and useful to kids! Let’s Just Laugh at That For Kids is a powerful resource for adults who want the best for the young people in their lives. 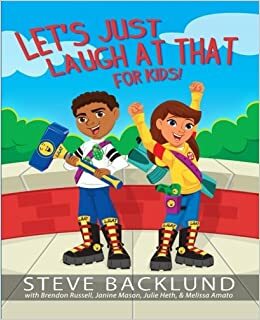 This book includes engaging stories, practical steps, and “laughter weapons” to teach children how to recognize and beat the lies the enemy tries to tell them. This is an interactive journey for adults and children to learn to “take every thought captive,” to reinforce truth and hope in their lives. All the lie-defeating weapons of this book are laughter activated because laughing at what the enemy is saying and planning helps us overcome the power of lies (Psalm 2:4).